Customer stories are a powerful way to reassure someone looking to buy from you. They’re an extended testimonial from a third party, much more powerful than, say, advertising, where you're beating your own chest. They're very factual. They're very driven by actual events.Stories connect people, build trust, transcend generations, engage our emotions, and they inspire us. And yes, they are contagious. But telling a compelling story that moves us to buy, or click “share” requires a bit of skill, based on ancient archetypes about how the brain uses emotions to make decisions. The Apple commerical follows the traditional hero’s journey that’s been used in myths for centuries. We have a hero with a goal, an obstacle that he overcomes. Here’s where so many success stories go wrong. They incorrectly identify the hero. You can follow this archetype to build some great customer stories, but unless you’ve correctly identified the “hero”, your story will fall flat. You are not the hero. Your product is not the hero. 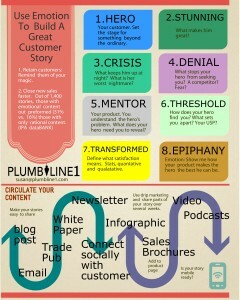 Your customer is the hero. Your product is the “wise mentor” that helps the hero achieve his goal. In our IPhone example, the hero, the misunderstood teen, uses the IPhone to create a gift for the family. If you want me to talk about you, tell me a story that makes my conversations more interesting — show me how you can help me become a hero.This form will take your directly to the download page for the fill-in-the-blank Build A Story Worksheet. 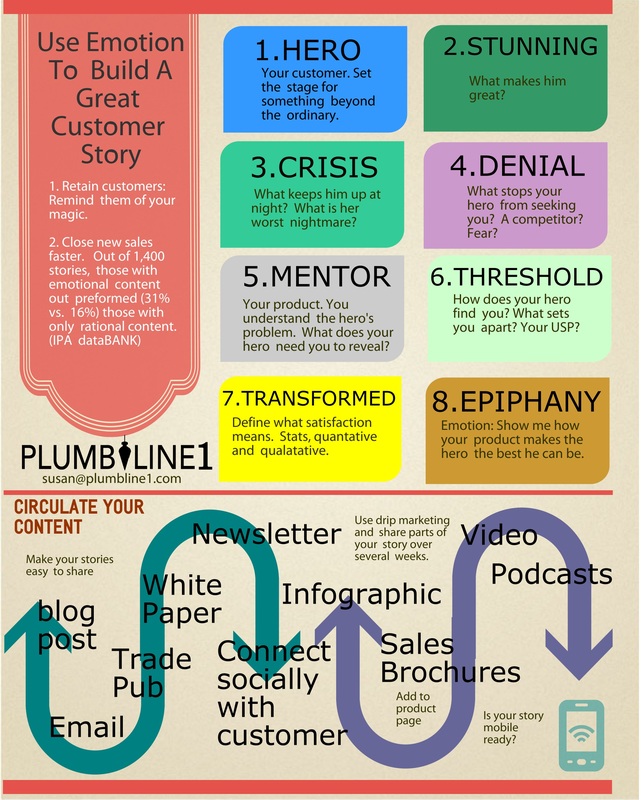 Writing customer stories that transform your sales cycle is essentially an art form. Just remember: Always make your customer the hero. If you need help, contact me. This entry was posted in Plumbline. Bookmark the permalink.